Bakugan Dimensions Shut Down on June 30, 2011! Last Friday was Friday the 13th indeed. Not only did we have a small power interruption in our street that caused me to read this news too late, there's also "this news" --- the news that Bakugan Dimensions will be shut down permanently on June 30, 2011! On behalf of the entire Bakugan Team, we would like to thank all of our Dimensions brawlers for logging on and battling online with us. We hope you have had as much fun playing the game as we have had. On June 30, 2011 at 10:59PM (PST), all servers will be shut down permanently. The servers will be functioning as normal until this time and we hope you will continue to enjoy the online world of Dimensions until then. We hope you are excited about the new season of Bakugan and all that it brings - from the all new Mechtogan, Mechtogan T.itans, and BakuNano to Die Cast Bakugan and to the stuff we haven't even announced yet! We look forward to the next chapter for Bakugan and we thank all of our loyal brawlers and fans who will continue to Brawl On. Don't forget to visit Bakugan.com for all the latest official Bakugan news and updates. There's already been lots of complaints concerning the MS Wave 2 Bakugan with no DNA codes. Now there's this. There has also been lots of speculations, like the theory of a manufacturing and distribution problem concerning the Bakugan with no DNA codes and another theory that there might be another online game to replace Dimensions in the future. There are still no facts and no answers to the questions raised by many of you. But we're hoping that Spinmaster and the Bakugan Team will clear things up by giving us answers and announcements in the very near future. This news is a little late in sharing. I'm sure a lot of you have already come across these changes and updates. EDITED: The main site of Bakugan, Bakugan.com, has finally been updated back in the beginning of March. The background is that of Zenthon and Dredeon (I thought it was Venexus) facing off each other. We also get to have a good look at the new Mechtanium Surge Bakugan that can be found in the Collection of the site. Not everything in Bakugan.com has been updated, however. While the background, the Bakugan collection, the Cards, and the Gameplay have been updated with new information and pictures, it seems the Bakugan.com Universe is not. The Gundalians plus Julie, Jake, Ren, and Fabia are still on the Characters database, and Dan, Shun, and Marucho are still sporting their season 3 outfits. With all the secrecy regarding the Mechtanium Surge season, maybe Spinmaster isn't ready yet to give any more spoilers. To travel to Interspace, use the Internet Terminal to "Log in to Interspace." The Internet Terminal is located next to the DNA console in front of the School. To travel back to Earth, use the Internet Terminal in the Interspace Plaza to "Log out of Interspace." The internet terminal is located near NPC Jason Willis. Please note this will not log you out of Dimensions. To travel to Neathia, walk through the starburst Portal located in the Downtown plaza. The portal is located just west of the fountain. To travel back to Earth, walk through the starburst Portal located in the Neathia plaza, which is the same portal that brought you to Neathia. Please note the World Map will display only the areas of the world you are in. If you are on Earth then your World Map will show the area maps on Earth. If you are in Interspace, then your World Map will show the Interspace area maps. And if you in Neathia, your World Map will display the Neathia area maps. There were also updates on the Gameplay FAQ, which are mostly about the use of the Mechtogan, Mechtogan Titans, and BakuNanos in brawling. In your set up to start brawling, you may have up to two (2) support pieces in any combination. Support pieces include Mechtogan, Mechtogan T.itans, Battle Gear, Mobile Assaults and Traps. During a battle on a Gate Card you may only play up to one (1) support piece. This has changed from the previous rule of being able to play all your support pieces during battle on a Gate Card. You may have up to three (3) BakuNano in addition to your support pieces and you may play all 3 BakuNano during battle on a Gate Card. Bakugan Dimensions Holiday Tournament heads into Playoffs! Bakugan Dimensions has finished up the sign up week of the Holiday Tournament! From all over the online world of Dimensions, brawlers have signed up for the 32 position tournament. The brawlers are now being seeded into the Bakugan Dimensions Holiday Tournament Playoffs for Saturday, December 4th. For scheduled match times and match-by-match live updates during the playoffs, check out the Bakugan Dimensions Holiday Tournament Playoffs and Finals Live Bracket here. If you are one of the valiant brawlers to be invited to participate in the tournament after signing up, please refer to the Bakugan Dimensions Holiday Tournament Playoffs and Finals Live Bracket for your scheduled match times. Playoffs Round 1 matches begin Saturday, September 25th from 10:00am - 11:00am PT with the full Playoff and Final day lasting approximately 3 hours. If you are scheduled to compete in the Playoffs please log into the Strikeflier server and travel to the Downtown Plaza 15 minutes prior to your scheduled time. A Tournament Official will pull both you and your opponent to the brawling grounds where you will conduct your match. Once completed, the Live Bracket will be updated showing your new match time should you advance to the next round. For more information regarding official rules, prizing, and tournament structure visit the Bakugan Dimensions Holiday Tournament Announcement here. 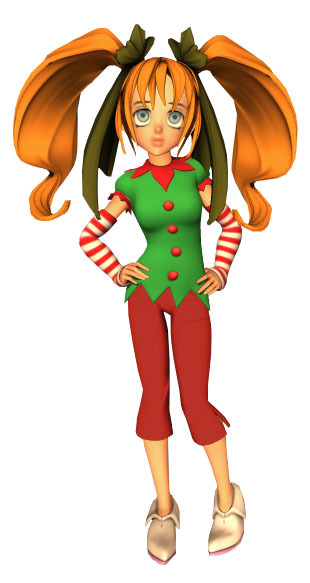 As always, read the Bakugan Dimensions Holiday Tournament Official Rules for more details. 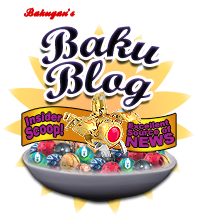 Get your bowl full of exclusive Bakugan insider information. It's an excellent source of your weekly news nutrition! Check out these cool new in-game items for your Bakugan Dimensions avatar! Choose among them and be in the spirit of the holiday season as Bakugan celebrates the holidays with all of us. 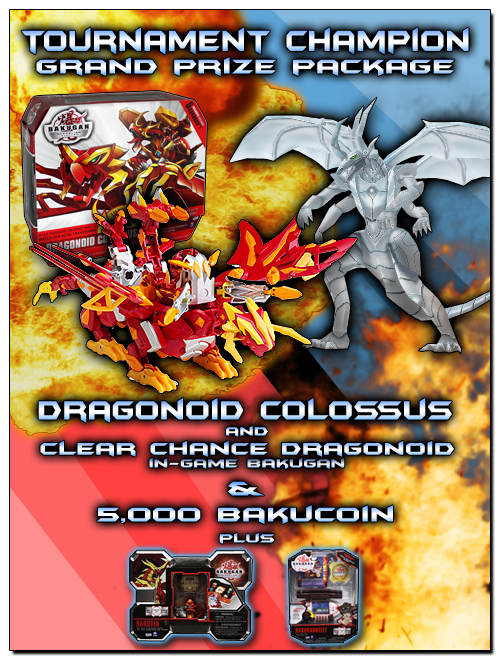 Bakugan Dimensions: Dragonoid Colossus Tournament – Compete to Win! Bakugan has gone... COLOSSAL! Next month marks a turning point in the battle against Gundalia as the ever-powerful Dragonoid Colossus storms onto the scene. Not only will the new Dragonoid Colossus create wakes in your real-life collections, but he also rips into action in your online collection. Bakugan Dimensions calls forth the most dedicated and skilled Brawlers to enter the Dragonoid Colossus Tournament! Ready up your most powerful Bakugan team, claim victories, and battle your way for a chance to win a new phenomenal sidekick, the Dragonoid Colossus. The tournament structure starts with a tournament sign-up week starting on September 13th and ending September 17th. Any level Brawler with any level Bakugan can sign up by visiting the official My.Bakugan.com community Dragonoid Colossus Tournament Sign Ups thread here. The first 32 brawlers to successfully sign up will be invited to compete in the Playoffs and Finals Day on September 25th where they will duke it out to claim the title as the Dragonoid Colossus Tournament Champion. Ready your most devastating Bakugan team for the Dragonoid Colossus tournament! * Live playoff and finals bracket will be updated as soon as matches are completed during the finals. Click here to access the Dragonoid Colossus Tournament Live Playoff Bracket. Certain restrictions apply, not all may be eligible to enter. The Dragonoid Colossus Tournament is open to residents of the USA, Canada, and Australia. Read the Dragonoid Colossus Tournament Official Rules for more details. Prizes do not stack. Participants will win the associated prize package according to how far they get into the playoff rounds. Certain restrictions apply, not all may be eligible to win. The Dragonoid Colossus Tournament is open to residents of the USA, Canada, and Australia. The first thirty-two players to successfully sign up during the Dragonoid Colossus Tournament Sign-Up week will be invited to compete in the Playoffs and Finals. The Tournament Sign-Up week starts on September 13th at 1:00pm PT and ends September 17th at 1:00pm PT. At the end of the Tournament Sign-Up week, the first 32 brawlers who successfully sign up will be contacted by email with their designated playtime in the playoffs. If you wish to participate, sign up by visiting the official My.Bakugan.com community Dragonoid Colossus Tournament Sign Ups thread here. The Dragonoid Colossus Tournament playoffs and finals will be held on September 25th, with the first round consisting of scheduled matches starting at 10:00am PT. The playoffs and finals will consist of single-elimination style rounds. For each round, the brawler who wins their match will proceed to the next round. The Final round consisting of the two last standing brawlers will be a Best of 3 match round to determine the Tournament Champion. Live playoff and finals brackets will be updated as soon as matches are completed. Click here to access the Dragonoid Colossus Tournament Live Playoff Bracket. Participants who make it to the playoffs must show up on time to play their scheduled match. Playoff and final matches will be scheduled by the Bakugan Dimensions Tournament officials. No exceptions or preferred game times will be made. For more details on tournament rules and structure, refer to the Dragonoid Colossus Tournament Official Rules. If you are one of the valiant brawlers to be invited to participate in the tournament after signing up, please refer to the Dragonoid Colossus Tournament Playoffs and Finals Live Bracket for your scheduled match times. Playoffs Round 1 matches begin Saturday, September 25th from 10:00am – 11:00am PT with the full Playoff and Final day lasting approximately 3 hours. To compete in the Playoffs please log into the Strikeflier server and travel to the Downtown Plaza 15 minutes prior to your scheduled time. A Tournament Official will pull both you and your opponent to the brawling grounds where you will conduct your match. Once completed, the Live Bracket will be updated showing your new match time should you advance to the next round. For more information regarding official rules, prizing, and tournament structure visit the Dragonoid Colossus Tournament Announcement here. As always, read the Dragonoid Colossus Tournament Official Rules for more details.